Get $10 off Race fee with Train to Run participation. 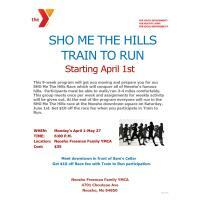 This 9-week program will get you moving and prepare you for our SHO Me the Hills Race which will conquer all of Neosho's famous hills. Participants must be able to walk/run 3-4 miles comfortably. This group meets once per week and assignments for weekly activity will be given out. 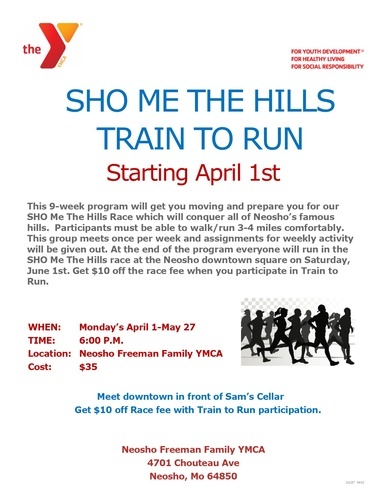 At the end of the program everyone will run un the SHO Me The Hills race at the Neosho downtown square on Saturday, June 1st. Get $10 off the race fee when you participate in Train to Run.